Free to donors is a red, campfire style stoneware mug featuring a block letter design with “Be The Good” in solid white lettering as an anagram of the “Believe There is Good in the World” message in outlined letters. 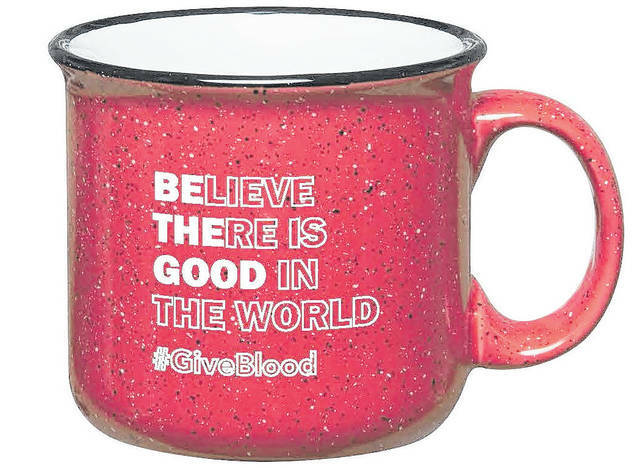 DAYTON — The “Be The Good” stoneware coffee mug is a gift to everyone who registers to donate at the Fairview Brethren in Christ Church community blood drive Monday, April 23 from 3 p.m. to 6:30 p.m. in the Great Room, 750 Union Blvd., Englewood. Community Blood Center encourages donors to schedule an appointment online at www.DonorTime.com or call 1-800-388-GIVE. The “Be The Good” campaign recognizes donors as a special force for good in the world. The message honors their kindness and encourages everyone to consider donating as a way to do good for others. The red, campfire style stoneware mug features a block letter design with “Be The Good” in solid white lettering as an anagram of the “Believe There is Good in the World” message in outlined letters. It’s free to everyone who registers to donate at a CBC Donor Center or most CBC mobile blood drives now through April 28. CBC is looking for more platelet and plasma donors in 2018. The automated process of giving platelets and plasma is called “apheresis” and the number of these special donors is dwindling. CBC’s most dedicated donors are ageing, with about 53 percent of the donor base now over the age of 50. CBC is calling on young people to become the “next generation of donors” and asking new and current donors to help CBC meet the challenges of the future by becoming apheresis donors. For more information about Community Blood Center/Community Tissue Services®, visit www.givingblood.org.